It's not clear who came up with the table, although it's done the rounds online for several years - and was first seen by the BBC in 2011 in a blog by Oxfam. 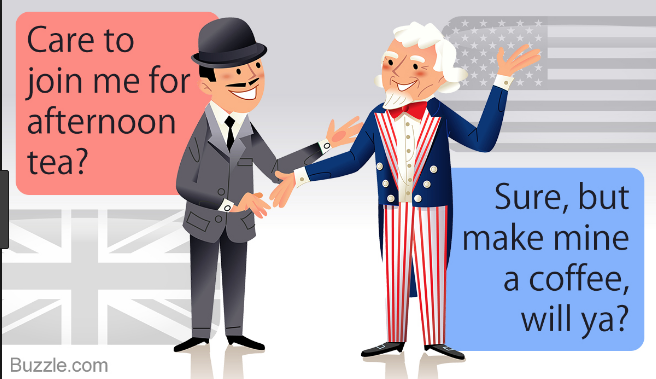 Britons like to think they have a "special relationship" with the US, based on a common language and cultural, historical and political ties. But as Winston Churchill, who by birth was half Brit and half Yank, often said in conversation but not in print that both countries (at times) are separated by a common language. Pundits claim the phrase was really fathered by George Bernard Shaw, unfortunately Brit scholars can’t find those words in any of GBS’s works. But it may have been Oscar Wilde in his 1887 work “The Canterville Ghost,” who deserves credit with writing “We really have everything in common with America nowadays except, of course, language.” That quote, at least, has been readily located in print. The point of this blog being, according to one of the UK's most respected polling companies, there's one chasm the English language can't always bridge - the British love of passive-aggressive statements. The starkest difference was in the phrase "with the greatest respect" - which most Britons took to mean "I think you are an idiot", but nearly half of Americans interpreted as "I am listening to you". 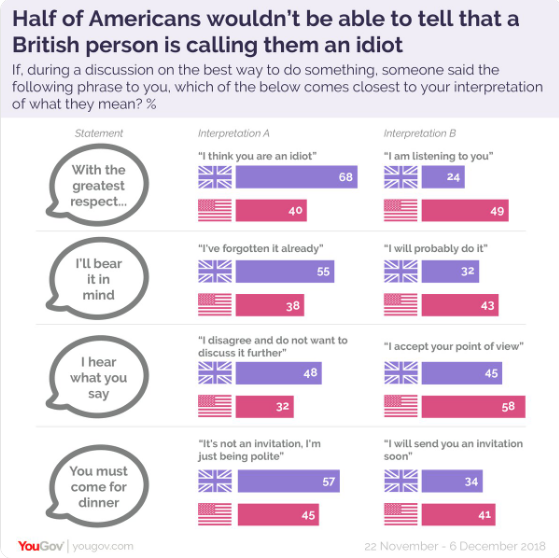 Half of Americans wouldn’t be able to tell that a Briton is calling them an idiot, finds our new study on British subtext. What does "with the greatest respect" mean? YouGov based its survey on a popular meme of British phrases and their subtext. YouGov decided to show the same phrases, and each of the meanings, to about 1,700 Brits and 1,900 Americans, and asked them which matched their own interpretation the most closely. The survey showed that some - though not all - of the stereotypes in the table were statistically correct. There was plenty of common ground - for example, a majority of both British and US adults consider "I was a bit disappointed that" a polite way of saying "I am annoyed that" - rather than "it doesn't really matter". But those in the UK are much more likely to consider "I'll bear it in mind" and "I hear what you say" to be attempts to brush you off. And a higher proportion of Britons than Americans (44% to 31%) think "that is a very brave proposal" actually means "you are insane". At the end of the day, while the British may like to think they have a more sophisticated sense of sarcasm, they might have more in common with their American cousins than they think. We'll bear that in mind.